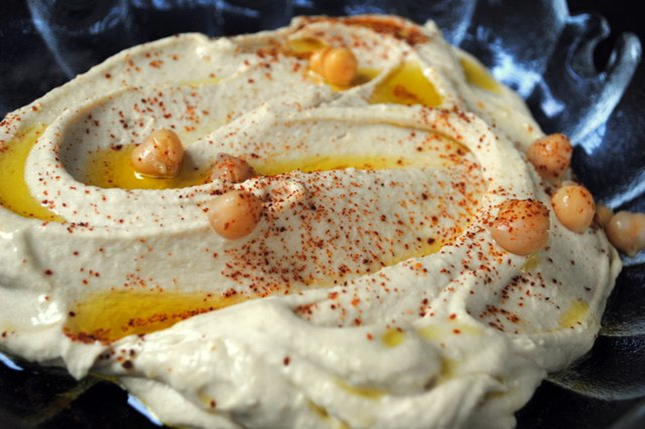 A food dip or spread made from cooked, mashed chickpeas blended with tahini, olive oil, lemon juice, salt and garlic. Kebabs or meatballs made with seasoned ground meat. An herbaceous salad traditionally made of bulghur, tomatoes, finely chopped parsley, mint and onion, and seasoned with olive oil, lemon juice, and salt, but there are other variations such as adding garlic or lettuce, and using couscous instead of bulghur. 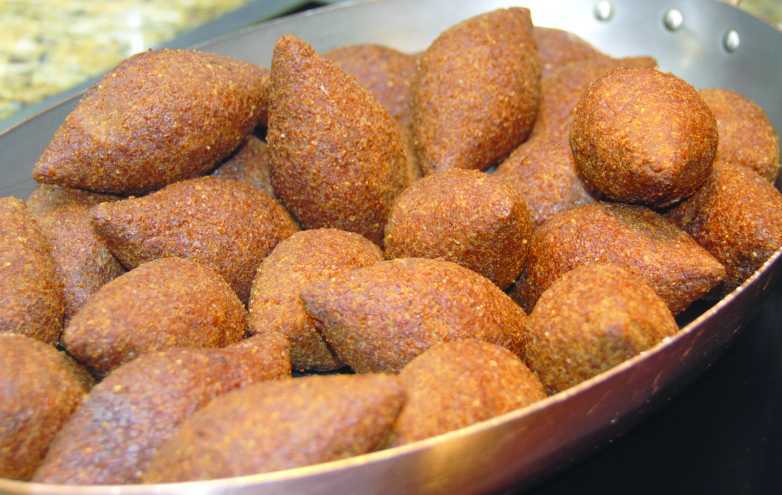 Kibbeh is the name of several dishes made of bulghur, which is cracked wheat, combined with minced onions, Levantine seasonings and finely ground lean Beef, Lamb, Goat or Camel meat. 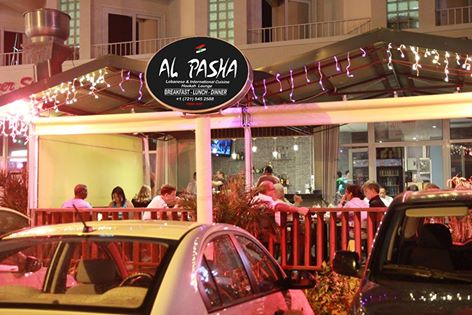 Kibbeh may be shaped into balls or patties, and fried, baked, cooked in broth or served raw. 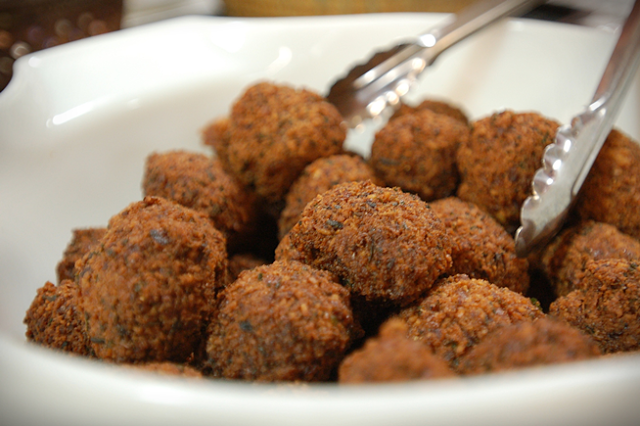 Probably the best known Kibbeh is Kibbe Raas, torpedo shaped fried croquettes stuffed with minced beef or lamb. 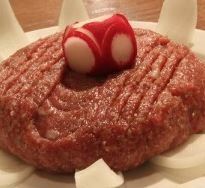 Spiced raw ground meat is mixed with bulghur and spread out onto a platter, drizzled with olive oil and served with onions and cucumbers. A layer of cooked, spiced meat and pine nuts is pressed between two layers of finer kibbeh, then baked and served in wedges or squares like pieces of cake served with salad and drained yogurt. Dolma refers to several stuffed vegetable dishes. Sarma is probably the most popular, featuring seasoned rice stuffed and rolled in grape leaves. Harissa is a delicious Hot Sauce made from ground Chilies , Garlic and Spices. A typical middle eastern meal starts with Mezze, it can be as simple as a basket of warm pita, served with a plate of fresh herbs, a plate of feta or yogurt cheese, a dish of olives, some dips and salads and a pitcher of iced water, or it can be an elaborate affair with dozens of small plates of delicious foods, including miniature versions of main dishes.There is an endless variety of meze to try. Some are vegetarian while others may have beef, lamb, goat, camel, or fish. Some are served hot and some cold. 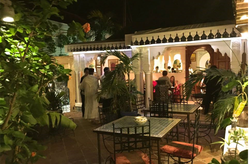 Contrary to popular belief, mezze is not considered an appetizer, because a mezze can be the entire dinner, thus it is more appropriate to compare mezze to the Scandinavian Smörgåsbord or the Chinese Dim Sum, rather than hors d’oeuvre, antipasti, or appetizers. 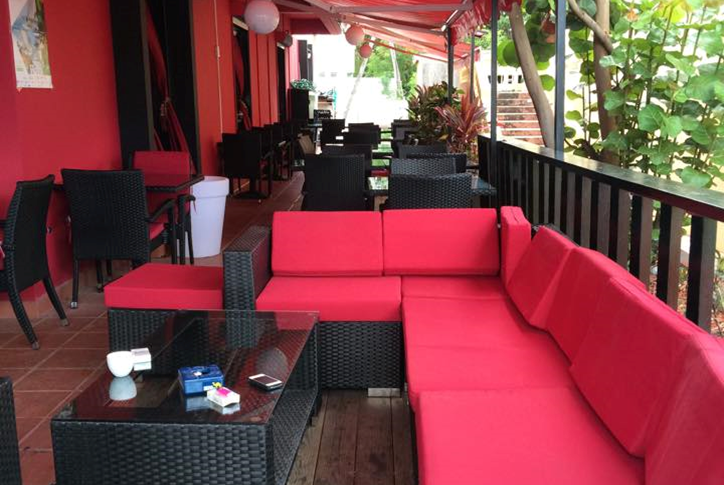 Pita is a slightly leavened wheat Flat Bread, either round or oval, and variable in size. 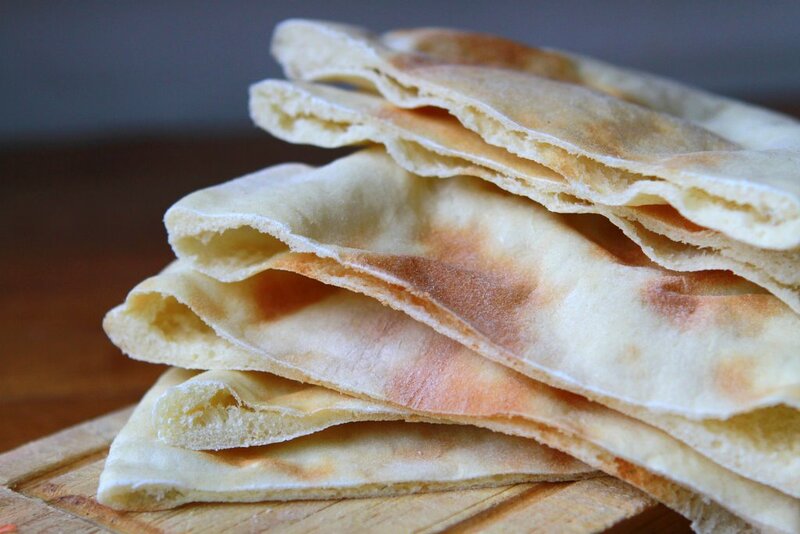 In the Arabic world, pita is a foreign word, all breads are called khubz (ordinary bread), and specifically pita is known as khubz arabi (Arabic bread). 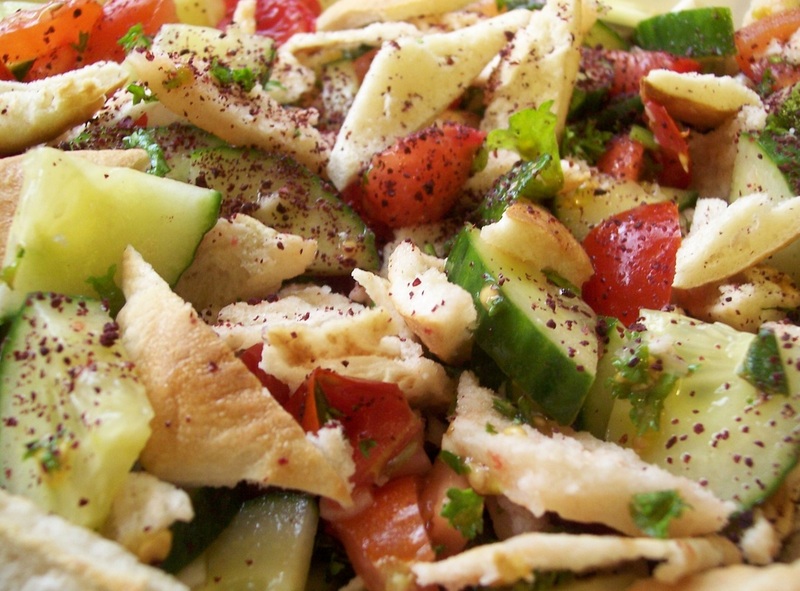 One of the best-known Middle Eastern salads and a standard dish on the 'mezza' table, Fattoush is a colorful salad usually made with lettuce, fresh Herbs, Cucumbers and Tomatoes tossed with broken pieces of toasted (or stale) Pita in a lemony dressing. 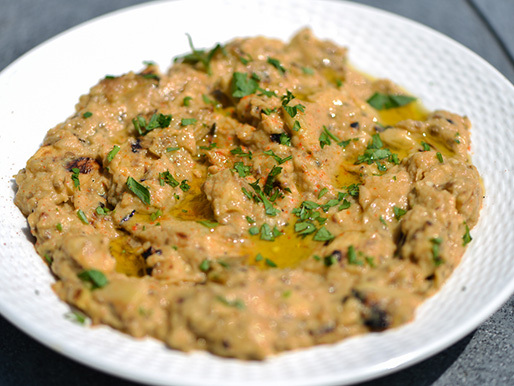 A savory purée of eggplant flavored with Tahini, lemon juice and fresh herbs. 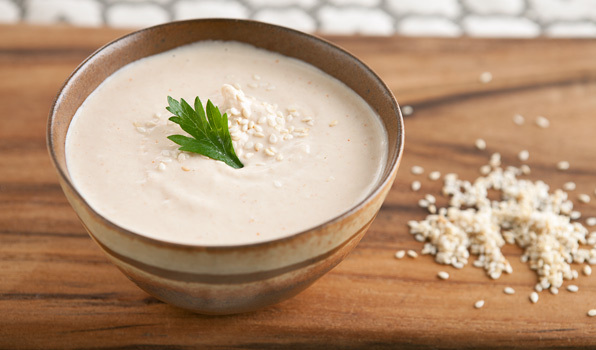 Tahini also called Tahina in some countries, is a paste made from ground sesame seeds. It is found in recipes such as Hummus. Tahini sauce is a thinner creamier sauce made with Tahini and usually Lemon Juice and Garlic. 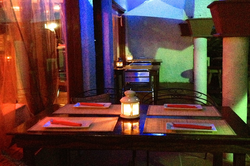 Merguez is a fresh sausage made with lamb, beef, or a mixture stuffed into a lamb-intestine casing. It is heavily spiced with cumin and chili pepper or Harissa, which gives it its characteristic spiciness and red color, as well as other spices such as sumac, fennel, and garlic. 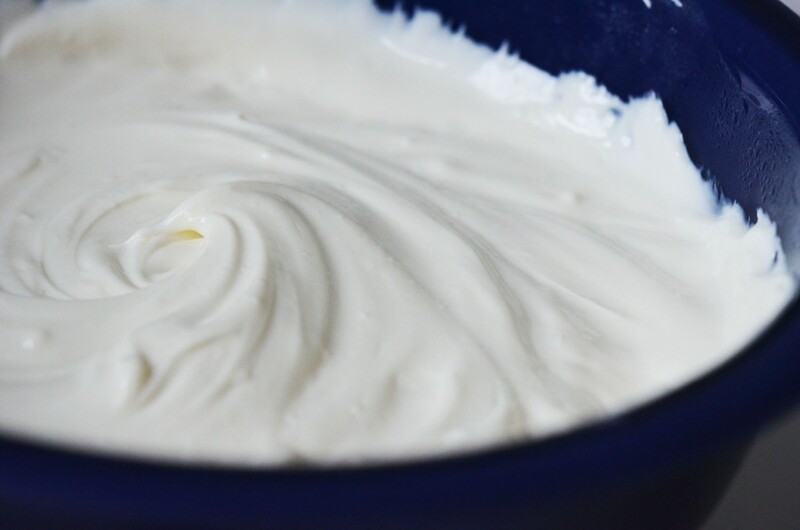 Labne is yogurt which has been strained to remove its whey, resulting in a thicker consistency while preserving yogurts distinctive, sour taste. 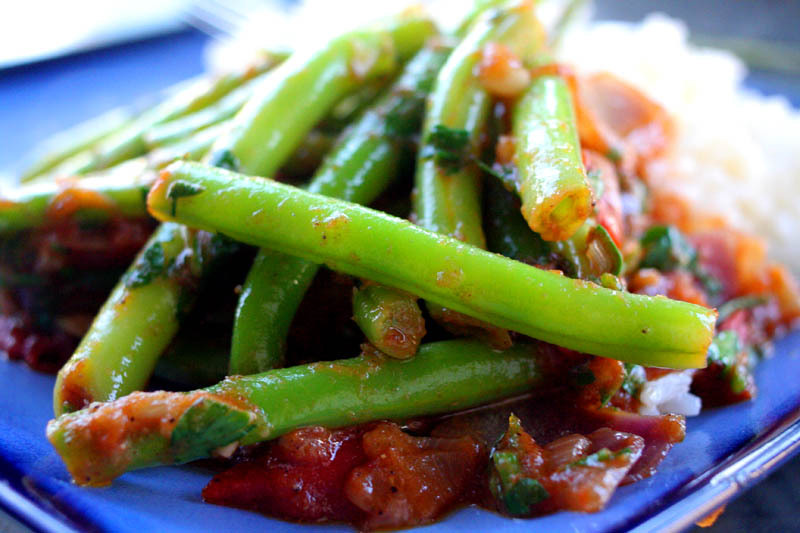 Loubyeh b’ zeit or green beans in olive oil (although technically it’s tomato sauce) is a Middle Eastern one-pot, vegetarian dish made of green beans, cooked with tomatoes and olive oil.